Shane Black loves a “buddy cop” film. After all, he’s kind of responsible for launching the genre with his Lethal Weapon screenplay, and again with his near-perfect directorial debut, Kiss Kiss Bang Bang. He even grounded Marvel’s beloved Iron Man franchise with his third instalment, pairing Robert Downey Jr with a smart-mouth kid. 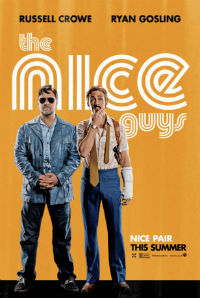 Still, even with the fresh 1977 Los Angeles backdrop, it’s hard not to make obvious comparisons between his latest offering and Black’s earlier work – and unfortunately for everyone, The Nice Guys falls a tad short. The pairing of Ryan Gosling and Russell Crowe is the stuff dreams are made of, with Gosling finally finding his feet as a goofball and Crowe echoing his L.A. Confidential role as the muscle. They work well together but again, to compare with Black’s earlier work, they’re just not as memorable as Gibson and Glover or RDJ and Kilmer. Gosling is undoubtedly the star of the film, displaying just the right amount of torment amid the very dry humour, and he’s fine-tuned that dumb-founded double-take he does so often. Still, the character’s huge downfall is that he’s just such a terrible father, and that’s something audiences just can’t laugh about these days, full-well knowing the ‘70s were a stranger time. In that sense, Crowe is really playing the straight man, but he doesn’t have an original shtick of his own to give him depth – to compare again, Val Kilmer’s Perry was incredibly smug and saw his partner as an inconvenience, while Glover’s Murtaugh was more conservative and hated following his partner’s lead. Crowe’s Jackson Healy isn’t defined, mixing too many conflicting traits. Instead of a Joe Pesci or Michelle Monaghan playing the third-lead, we have newcomer Angourie Rice. She’s fantastic by the way, really talented for a kid, but that’s also the reason it didn’t work – she’s a kid. It’s hard to cheer when she’s doing things no kid should be doing. The narrative is nowhere near as quick or clever as Kiss Kiss Bang Bang’s either, which had similar interconnecting stories but managed to tie them together. Black attempts the same feat here but misses the mark, and then blatantly sweeps it under the rug. Similarly, Black used narration effectively in Kiss Kiss Bang Bang, with RDJ introducing new characters, driving the plot and even signing off directly to camera. The same thing is attempted here, with Crowe and Gosling narrating their introductions, but then we don’t here from them again until the very end when they need to explain one of the twists. The best thing about The Nice Guys is definitely in regards to set design, location scenery, costumes and music. Combined they were able to recreate the seedy and sticky L.A. era, which really made you feel like you were along for the ride. All in all, The Nice Guys is better than most films coming out these days; giving the audience something semi-intelligent to work with. Still, considering Shane Black is responsible for some of the most memorable dialogue to hit our screens, it’s not his finest work.